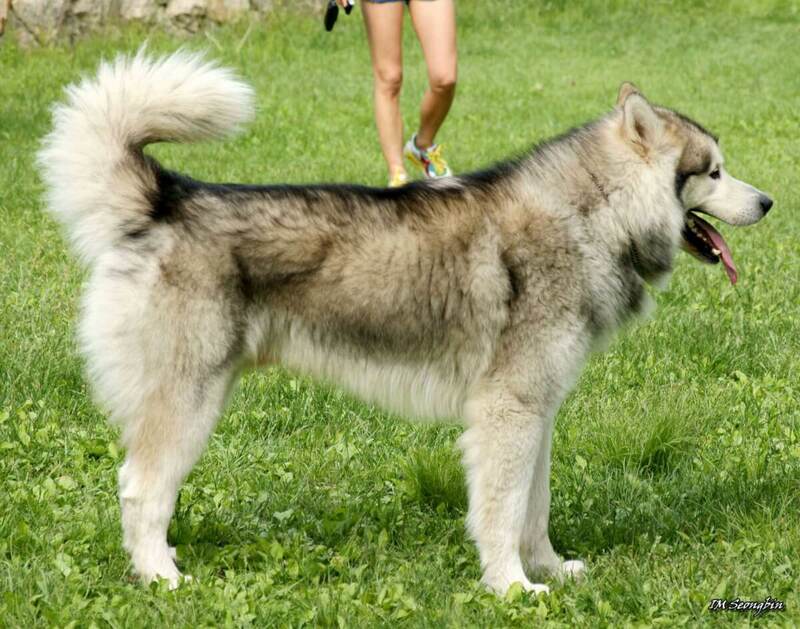 The Alaskan Malamute is an extremely strong dog breed which look very similar to large wolfs. The breed was originally bred to help pull heavy sleds through deep snow and were later used to help hunt polar bears and seals. Despite the breeds wolf-like appearance, they are fully domesticated and make poor watchdogs and guard dogs as they consider everyone their friend. 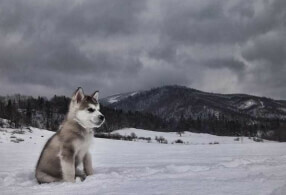 Alaskan Malamutes are considered to be independent thinkers, so they can be stubborn when it comes to training. The breed has a high prey drive and a lot of energy, so it is recommended to socialize them at a young age and give them ample exercise to keep their mischievousness under control. 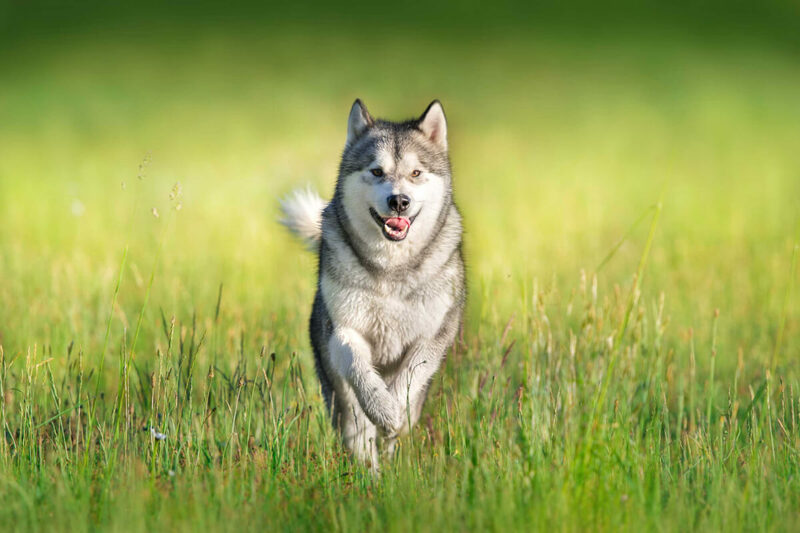 For centuries and perhaps even millennia, the Alaskan Malamute was a sled dog who also helped to locate food and be a hunter alongside humans. These days, they remain in that capacity but only in certain regions. In many places, they are companion animals and family pets. They are not, however, for people who are not significantly experienced with dogs. They prefer to be inside most the time but are not lapdogs. They love to sleep most of the time but they need a great amount of exercise. They will eat whenever they can but they should have a strict diet. These are some of the many things that must be closely managed and supervised. Most of all, some places consider them highly dangerous and have made them illegal to possess in any fashion. They carry a stigma regarding attacks that makes people uneasy. The Alaskan Malamute is a large dog breed and it's not uncommon for males to be as tall as 25 inches (from ground to shoulder) and weigh over 100 pounds. Their large size makes them favorable for sled pulling sports and perfect for amusing children by pulling them on skates, wagons, etc. 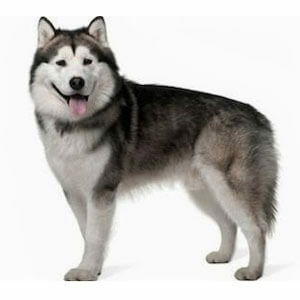 Alaskan Malamutes are well known for their friendly and playful behavior. They commonly greet everyone as their friend, even complete strangers, which makes them a poor choice for a watchdog or guard dog. The breed does well with children, however their size and strength makes it easy for them to knock over smaller kids, so it is always recommended to monitor Alaskan malamutes when around children. 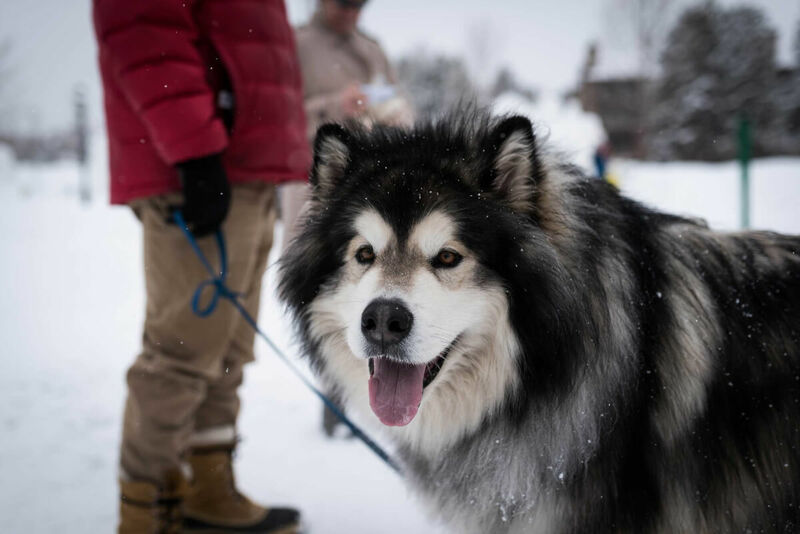 As pack animals, the Alaskan malamute does well with other dogs, however they have a strong prey drive so they may view smaller animals such as birds, cats, and toy dogs as prey. Alaskan malamutes have an odor free coat and they have a cat like tendency to lick themselves to keep their coats clean, so they don't require frequent baths. However, since the breed is adapted for arctic cold, they will shed heavily twice per year and will need to be brushed daily to keep loose hairs from shedding. The breed has high exercise requirements so they will need frequent play time and daily walks to help burn off some of their energy. Since the breed is suited for cold weather, they will need to be walked at nighttime or cooler times of the day if they live in a hot climate. 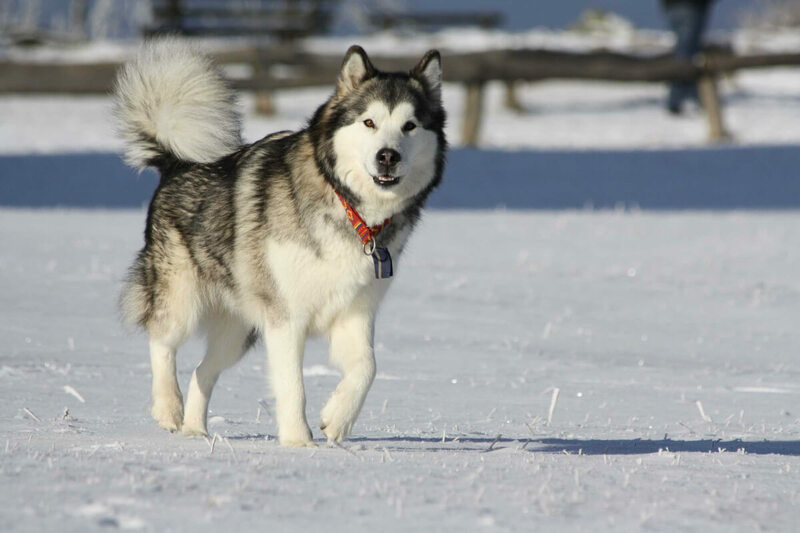 The Alaskan Malamute may be the oldest dog breed on the North American continent. These dogs may also have the world's oldest and longest association with humans. 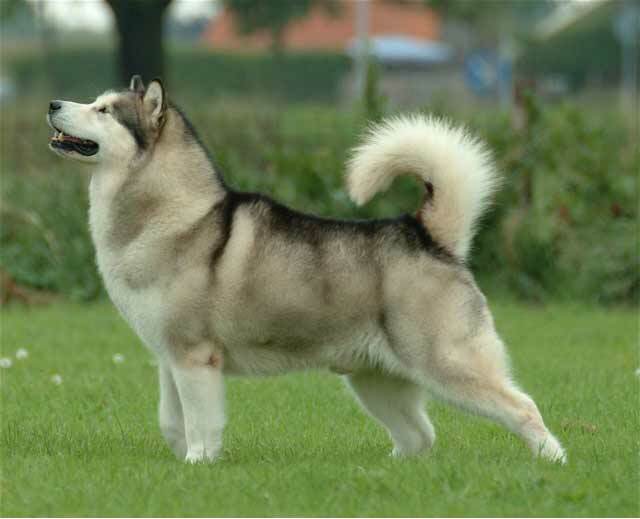 According to the history told by an early 20th century American Malamute breeder, Paul Voelker, there are bone artifacts dating back 20,000 years that feature the Malamute. 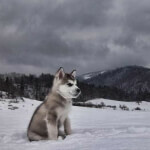 The dog's name comes from an Inuit tribe of fishers and hunters called the Malamutes, a people who had dogs that are believed to be the forebears of today's Alaskan Malamute dogs. This nomadic tribe lived in weather so extreme that death was often always nearby, and they had a symbiotic relationship with the dogs. It was not until the late 19th century that the Western world became aware of the dogs. 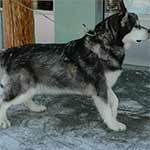 The Klondike Gold Rush may not have happened had it not been for these and other sled dogs. It did not take long for the dogs to be crossed with other breeds in attempts to improve the dogs as well as to lessen their ferocity toward humans. In 1935, the American Kennel Club (AKC) formally recognized the breed. There were not many of the dogs, and most of those registered did not have the provenance of ancestry. The registry remained open for only a few years. The breed's popularity exploded in 1925. That year, they were one of the many sled dogs that delivered serum via the Iditarod Trail to Nome, Alaska during a diphtheria outbreak. A few years later, in 1928, Alaskan Malamute history was further enriched when Commander Richard E. Byrd took some with his during his first Antarctic expedition. When the dogs' service in WWII nearly wiped out the breed, the AKC re-opened the stud book. That was in 1947, and there were said to be approximately 30 Malamutes known to be alive. In 2010, Alaska declared the Alaskan Malamute the official state dog. The Alaskan Malamute is a big-boned dog whose coat will give them an even larger look. This is an extremely sturdy breed with a powerful look that is often far more fierce than the dogs tend to be. The Mal's broad head and long muzzle are slightly round on top with almond-shaped eyes. They have small, triangular ears that look compact due to the heavy fur on them. These dogs have a distinct scissors bite with very large teeth. The arched, strong neck leads back to a set of slightly sloping shoulders and heavy forelegs. The muscular body and deep chest hold up a straight back that slopes slightly down to very powerful hind legs and a bushy tail that curves upward. Their paws are wide yet compact with thick pads and strong toenails. The double coat is typically of coarse hair in the guard coat (top layer) and fine, thick undercoat hairs. The overall Mal coat is moderate in length. There are many Alaskan Malamute coat colors, and there tends to be a lot of debate and discussion regarding the colors too. Perhaps the biggest debate is whether there are rare colors and what those colors are. Some people say there are no rare coat colors for the Mal, and others say that there are. In that latter group, some say blue is rare, or lilac, or even red. The biggest discussions tend to be about all-white Malamutes as well as agouti Mals. These colors seem to be the most popular for this breed. The white Mals may have a slight cream tint to them yet are still deemed white. The agouti coat is made of hairs that have different colors within them, and this gives the coat a very complex look not unlike a brindle pattern. 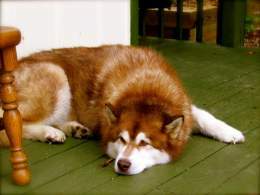 The average weight of the Alaskan Malamute is different between males and females. Fully grown, the female weight is 70 to 85 pounds, and the mature male is 80 to 95 pounds. The height of the full-size male is 24 to 26 inches whereas the female stands 22 to 24 inches. You may want to get a weight chart from your vet to make sure your Mal is proportionate to his or her height. 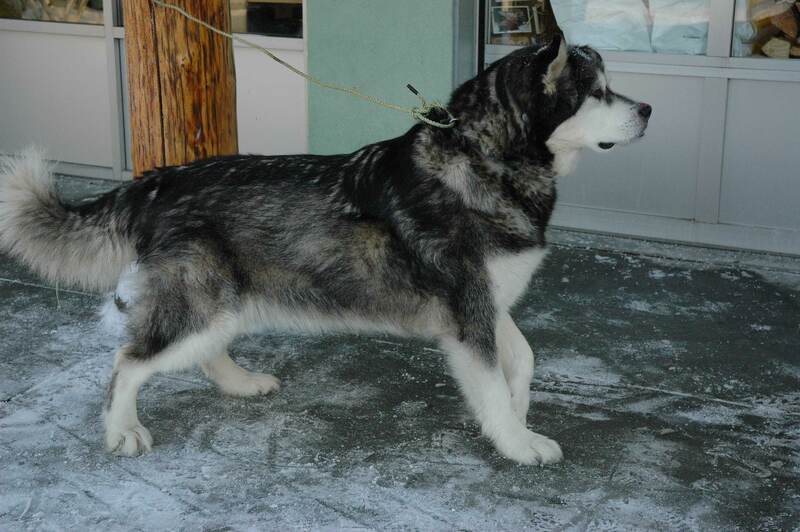 There are said to be many Alaskan Malamute sizes, and information on them can be found in the Variations section. According to some, there are different ways of determining variations of Alaskan Malamutes: some say it is fur length, and others say it is size. Then there are those who claim there are no real varieties, just bigger and smaller Mals and different bloodlines. Those who are in the coat size camp identify wooly and regular (or smooth, or "short haired") Mals. The wooly variety is truly wooly; there is an amazing abundance of hair and it is very fluffy. Those who identify varietals by size are also divided. 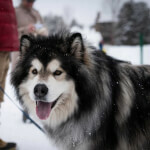 There are some who say there are Mals and giant Alaskan Malamutes, but others who say there are more than those two sizes: Large Standard and Upsized are two of the other sizes they may claim. There seems to be no standard regarding size, let alone the names assigned by various breeders. The bloodlines, or strains, of Mals that came from different early kennels (established in the late 19th and early 20th centuries) are sometimes used to identify variations too. Oftentimes, these bloodlines are associated with size. The largest dogs were from the M'Loot strain, and they were frequently bred with the smallest bloodline, Kotzebue. The Hinman-Irwin was the third of the strains. None of these pure bloodlines exist today, however, as they have been crossed inside and out. 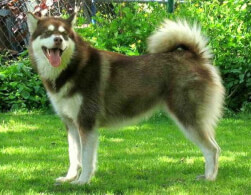 The Alaskan Malamute temperament is a dual one: they are very playful, they love people and they have endless energy to work and play all day. On the other hand, they are stubborn, difficult to train and will do whatever they want if they feel you are not the boss or equally strong. These dogs will test you constantly, and you'll find their behavior vexing at times. While they are puppies, Alaskan Malamutes must be socialized and trained properly to not "mouth play," to not chase other animals and that you are serious. They are remarkably smart, and they will always be seeking to use their traits to outsmart you. While they are very fierce when they need to be, they don't make good watch dogs as they welcome even strangers into their presence. The only time they may become aggressive toward people when there appears to be no threat is when someone gets near the dog's food. An Alaskan Malamute with kids is a wonderful combination. These dogs are easy-going and can tolerate quite a bit of rambunctiousness. Your Malamute will be a great playmate with the young 'uns so long as they are mature enough. Because these dogs are very energetic and constantly playful, they may knock over or accidentally hurt babies, toddlers, and very young or small children. You should supervise any interaction with your Malamute and kids under 6 years of age. 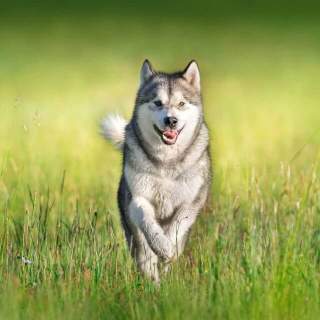 Unlike their behavior toward people, the Alaskan Malamute is extremely territorial toward other dogs. This can quickly develop into fierce aggression. With non-canine pets or animals, these dogs are highly predatory. 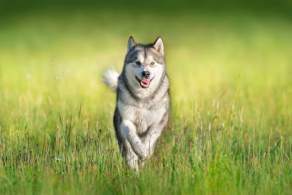 Cats, rabbits and other small, furry creatures will almost always run and you can be sure a Malamute will give chase. Malamutes are simply not to be trusted around such pets. Even with a lot of proper training and socialization, there may well be big problems. It's best to avoid letting Malamutes be around them at all. 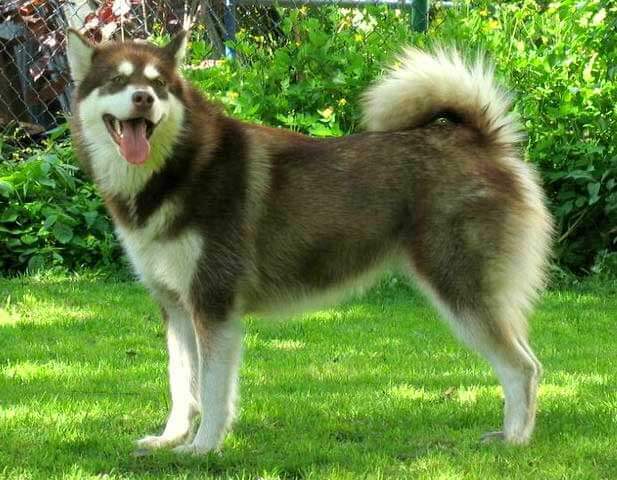 Below are pictures of the Alaskan Malamute dog breed. As a family pet, the Alaskan Malamute is prone to separation anxiety, sensitivity and a desire to stay indoors. They don't bark much unless you leave them alone a lot or for long periods of time. They are all too willing to allow people into your house and yard so long as that person doesn't get near their food too. 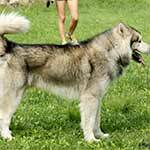 Understanding this breed's complexity is best with an Alaskan Malamute owner's guide. If you own a Mal, they need a fair amount space despite their desire to remain indoors. They love to dig, and you shouldn't stop this. Get a sandbox or designate an area where they can dig. And be sure to have a very tall and strong fence because they can jump very high. 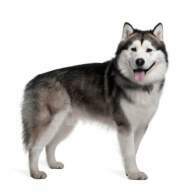 You may be wondering, Are Alaskan Malamutes hypoallergenic? They most certainly are not, and when they do one of their typically twice-annual blow-outs, you can expect the hair to fly like snow in a blizzard. 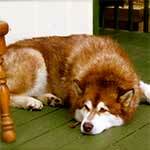 Although the Alaskan Malamute is a physically strong dog, this breed still has many possible health problems. Some are congenital, some occur due to diet and still others may happen because of the dog's over-exertion. As these dogs are popular, expensive and often marketed according to their rare colors and so forth, you should insist on proper health test and vet certifications. Mals have an average lifespan of 10 to 12 years.